A trip to a museum can be a fun family activity that engages the senses and inspires creativity. But without some advanced planning and a flexible attitude, things can get a bit hectic. As a museum enthusiast, I’ve taken my kids to many art museums in Los Angeles and we seem to have figured out a good flow for spending a day at the museum. Here are 10 ways to get the most out of a trip to an art museum with your little ones. 1. Be Prepared: Get the basics down before you leave. Know which days and times the museum is open, where to park, and where to eat. Pack some snacks for the kids in sealed containers – they always come in handy. 2. Have a Plan: Avoid the stress of trying to figure out what to do when you get there. Visit the museum’s website beforehand, and choose which family activity, upcoming event, or pieces of art you want to see. 3. Go Early: Arrive early and beat the crowd. Parking is easier, you’ll avoid long lines, and your kids will be fresh and well rested. Give them time to play outside to help them settle down before entering the museum. 4. Discuss the Rules: There are really only a few art museum rules that children need to know: no touching, no running, and no eating inside. In your discussion about what not to do, be sure to tell them what they can do; have fun, see colorful art, and play games. 5. Set the Tone: Be enthusiastic and your kids will follow your lead. If you see something you really like, spark their interest by saying, “Wow, look at that!” Before you know it, they’ll do the same. 6. Less is More: Focus on a few objects that interest your children or try one family activity. An hour or less of gallery activities is usually enough, especially for younger children. If they want to do more, try taking a stroll through the galleries letting your children guide the way. 7. Be Playful: Avoid giving your children too much information. Instead, ask them open-ended questions that foster creative interactions and conversations like “What do you see?” Or play “I Spy” and ask your children to find and count shapes, colors, animals, and other details. 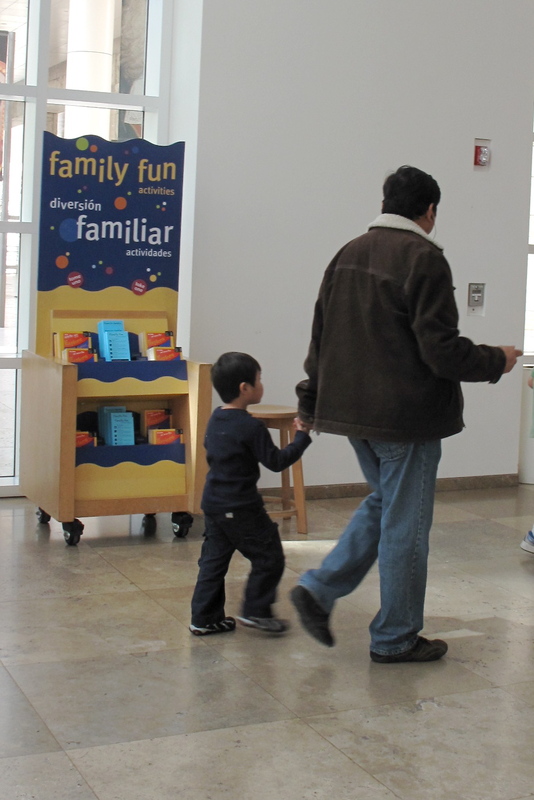 Most art museums offer family guides with lots of interactive activities. 8. Be Flexible: Be open to diversions your children might find along the way – they can sometimes lead to the best art adventures. If your children loose interest in an activity, let them pick something else to do. Remember it’s their day to explore the museum. 9. Take a Break: When the kids start getting restless, take a break. Museums often have gardens and outdoor areas for kids to enjoy. They’re a great place for kids to eat snacks, relax, and run around. 10. Know When to Leave: End your visit while your children are still enjoying the museum and before they get tired. Even though you may not have seen and done everything you planned, there’s always next time. When you get home, talk about what you saw and did at the museum. Go to the museum’s website to learn more, play games, and find books about things your kids liked at the museum. If your kids had fun and want to go back for more, you know you’ve had a successful family day at the museum.